Here's a trick to play on someone, take one elevator and paint the bottom of it with an anamorphic illusion to make it look as though it has no floor. 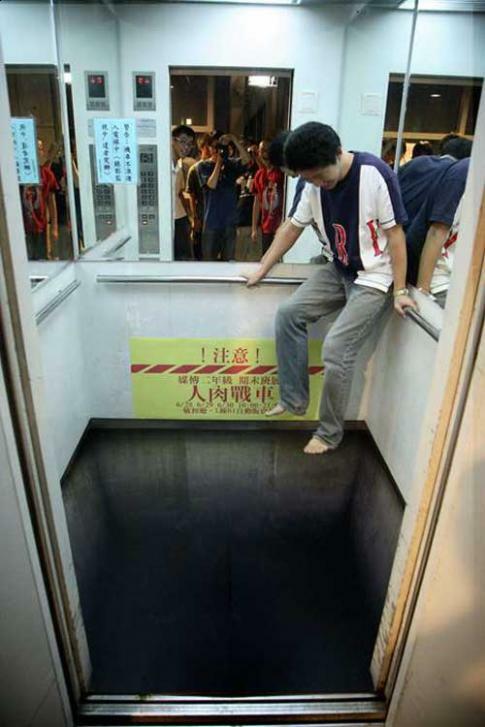 This fellow doesn't want to stand on it and I don't blame him, the 'hole' looks so real its hard to tell that its only an illusion. Would you stand on there ? lol...I don't think I would want to stand on that either! nvmmmmm. its painted... lmao ? i think that is very creative cuz wen i first looke dat it i thought it have an elebvator floor as well. Good god, I would be scared if I was there!!!! ah! that would be sooo scary! i have a concert 2night luvs. it wasnt stupid it was pretty cool.i wouldnt blame the guy for not wanting to step on it.i would probably step on knowing me. if it was a actual hole and i was in that elevator i would pee my pants. :D very funny "missing floor" ha ha! OMG, that is MEGA! I defenitely would be scared of it, I'd probably poke it, but when I knew it was just a floor I'd go in it, obvs. Lmao ! once I figured it out I would stand (or sit) in the middle just to see how many people I can freak out! it's not too scary. if it was glass it would be scary. I would sooooooooo stand on that!!! Good that it was just a painting... or otherwise you people can cause heartattack to others.